Let me preface this by saying that I don't remember a singular mention of asparagus in this book. And let me next apologize for not making dainty, colored shells filled with creams, jellies, and ganache in an array of alluring flavors. Because way-back-when (a couple of months ago), I basically vowed that I would be making macarons in honor of our current Cook the Books selection, The Color of Tea. You see, I'd already enjoyed this book once before. And I mentioned that the heading of each chapter sets the mood with a particularly delicious sounding macaron flavor like Coconut with Passion Fruit-Spiked Buttercream, Vanilla with Raspberry Markings and Raspberry Gel insertion, and Honeycomb with Milk Chocolate Ganache. You know, just to name a few. Our main character, Grace, actually opens up her own shop that serves macarons in the city of Macau, China. I mean, in this novel, macarons are basically a metaphor for the delicacy, fragility, and beauty of life. And yet, I didn't make any the first time I shared The Color of Tea with you. And now, I'm not sharing them with you this time, either. I'll admit that it does have a teensy little bit to do with my week-long macaron making (or rather, attempting to make) marathon. I've sort of put the task of mastering the macaron on the backburner. I mean, I'll happily eat them with gusto should they appear in front of me - I just haven't been in the mood to try baking any myself again. But amidst the array of enticing macarons sits the most delectable...the most sensuous...the most unforgettable tomato tart. It lurks in the underbelly, in the background, if you will. 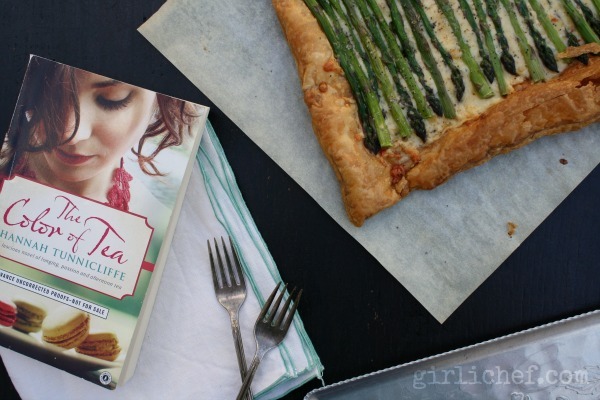 But I think the tomato tart that Grace associates with her mother, and with her husband, is the epitome of love in the novel. Next to the peaches were boxes filled with tomatoes still clinging to their vines. The ripe tomato smell was almost sexual. It filled my nostrils as I lifted up a box. 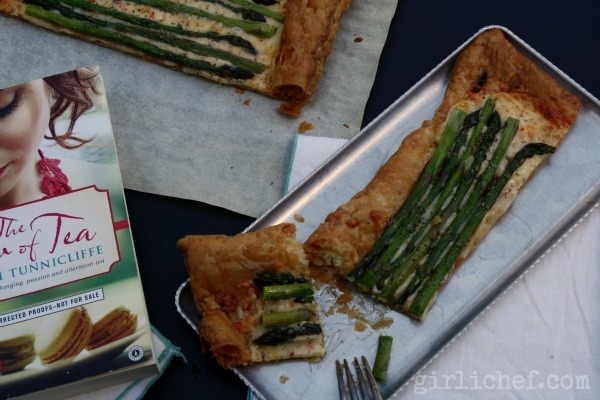 So, since it is full-on Spring, I turned to a veg that is in season right now to make my tart, Asparagus. Half of the slender spears standing at attention, the other half slightly bent to one side, as if swaying to the music...green and dusky purple. I also found a block of Monterey Jack cheese with brilliant red flecks of roasted red peppers inside that I knew needed a place in the tart. Add a little garlic oil...a smattering of black pepper and the smoked sea salt I'm so obsessed with, and it makes Spring seem almost as sensual as Summer. Preheat the oven to 400° F. Flip a baking sheet upside down (or use a rimless baking sheet), and set a piece of parchment paper on it. Lightly flour a work surface and roll the sheet of puff pastry dough out into a rectangle that measures approximately 16" x 10". Lightly score a 1-inch border all the way around the dough, without cutting all the way through. Dock the dough, inside of that border, all over with a fork. Slide into preheated oven and bake for 15 minutes, or until golden. Remove from oven and scatter cheese as evenly as you can over the puff pastry, inside of the border. Trim the ends of the asparagus so that they fit neatly inside of that border, as well. 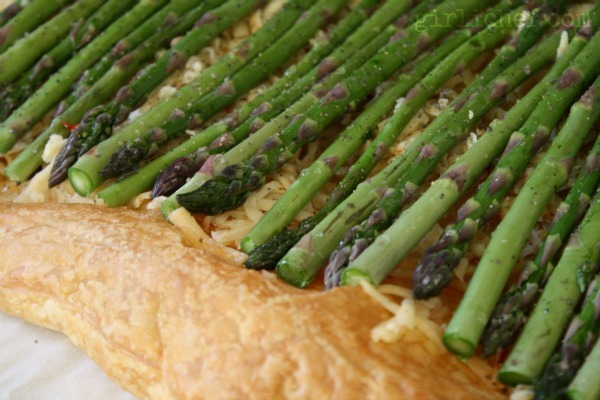 Line the asparagus up on top of the cheese, alternating every spear, tip to tail. Drizzle the garlic oil all over the asparagus, and sprinkle with salt and pepper. 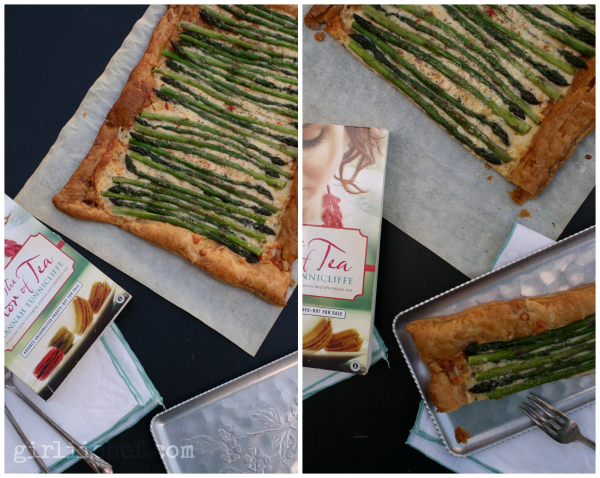 Slide back into oven and bake for another 20-25 minutes, or until the asparagus is just tender. Feel free to use any type of cheese you like; swiss, gruyere, or fontina would be nice, as would goat cheese. You could substitute olive oil for the garlic oil, if you wish. And speaking of garlic, scattering a handful of roasted garlic cloves under the asparagus would be nice, too. The Color of Tea was chosen by one of my Cook the Books co-hosts, Deb of Kahakai Kitchen, as our foodie-read for this round. Submissions are due by the end of the day on Monday, May 27. Also, join us for our next book, chosen by Simona of Briciole - How to Cook a Wolf by M.F.K. Fisher.